Long before the on-screen triumphs that Marvel is now experiencing with their linked universe of generally well-received films, they had an at-best spotty history with cinematic adaptations of their characters dating back almost 70 years. 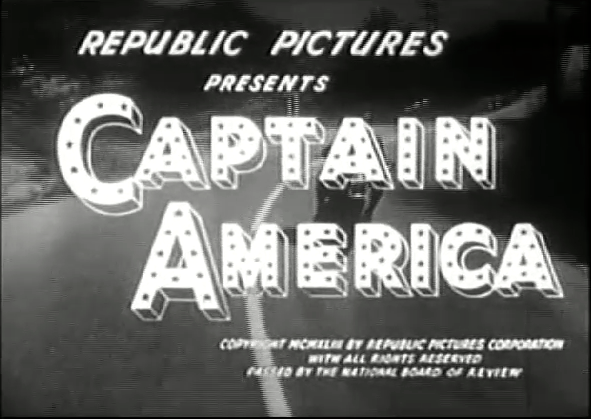 The first Timely/Marvel character to grace theaters was Captain America, via a 1944 Republic Pictures serial. Unfortunately, Republic, which had done a fine job on other heroes such as Spy Smasher and Captain Marvel, completely dropped the ball (and the shield!) on this one. Cap is not Steve Rogers, but crusading D.A. Grant Gardner, who fights evil in the familiar costume, but without the one item most associated with Cap–his shield! The shame is that the action sequences are typically outstanding, but too much tinkering with the core elements (a soon-to-be recurrent problem) robs the film of much of it’s credibility with comic fans. Excepting a failed attempt at a 1950’s Sub-Mariner TV pilot, it would be over 20 years until a Marvel character’s filmed image would pass through the gate of a projector, and that would only be in animated form. Some were excellent representations of the style and stories of the period–the 1967 Hanna-Barbera Fantastic Four and the Grantray-Lawrence Spider-Man took their plots directly from the comics, and the 5-day-a-week Marvel Super-Heroes (Cap, Iron Man, Hulk, Thor, Subby) lifted the artwork as well, replacing true animation with quick pans across still shots of mostly-Kirby panels. I know this sounds miserable, but you had to be there–it was pretty cool when you were ten! 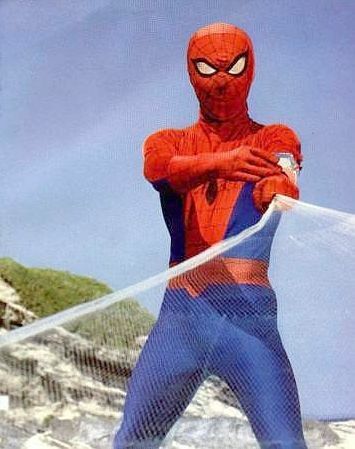 Animation would be the only vehicle for Marvel characters until the 1977 CBS premiere of Spider-Man, starring Nicholas Hammond. An earnest attempt at the origin, but with only JJJ present from the supporting cast, no super-villains and, even allowing for the vintage, some of the worst FX you can imagine (you won’t believe Spidey’s webbing! ), the show died a rather quick and justified death. Spider-Man was followed to the airwaves by Universal’s stellar series, The Incredible Hulk, starring Bill Bixby and Lou Ferrigno. Budgetary and technical issues would preclude scenes of “Hulk Smash!”–type destruction, but re-casting the plots into a knock-off of the popular “Fugitive” series allowed Mr. Bixby’s “David” Banner (see #1 note below!) to be one of TV’s most sympathetic figures during the show’s 5-season (plus 3 TV movie) run. Universal, hoping to capitalize on Hulk’s success, would follow-up with other projects: two miserable Captain America TV movies (featuring the son of the WWII hero), and the quite-interesting, though drastically altered Dr. Strange. Once again eschewing the comic book origin, Dr. Strange at least captured the tone, including some very Ditko-esque other dimensions, and a not-too-bad Dormammu stand-in. The two leads, Peter Hooten as Stephen Strange, and the deliciously wicked Jessica Walter as the evil sorceress Morgan LeFay, both played it seriously, and to good effect. George Lucas would come a-calling at Marvel’s door in 1986, and since the Ewoks worked so well, he thought he would take a stab at Howard the Duck, a film now firmly established as one of cinema’s great mistakes. It’s not as bad as you would expect, but that’s like saying “Would you please push those needles further under my fingernails, rather than shooting me in the head”? The origin sequence is O.K., but Howard’s sarcastic tone is muted, the book’s social commentary is almost wholly absent, and you never buy for a second that you’re watching anything other than a man in a duck suit. Maybe George will “fix” Howard as he did “Star Wars”—Waauggghhh! Much better was the 1989 Punisher with Dolph Lundgren. Made on the ultra-cheap, it still manages to get the gritty feel essential to the character’s milieu, and there is an attempt at pathos, but…it is Dolph Lundgren we’re talking about, so the effort, though well-intended, falls flat. That blandness, and the lack of his signature “skull” (see #2 note below!) combine to cripple a promising effort. In the wake of Tim Burton’s “Batman”, producers began looking at Marvel properties to develop, but the two projects to be completed, the 1990 Captain America and the now-infamous 1994 Fantastic Four, both suffer from tremendous budgetary constraints, although both films display a sense of verisimilitude that some later major studio films would lack. Captain America starts promisingly, with an accurate origin and fairly faithful costume, but runs off-the-rails rather quickly during an interminable second act that features Steve Rogers’ search for a cured-by-plastic-surgery Red Skull (now an Italian Fascist! ), very hammy performances by the usually-reliable Ronny Cox and Darren McGavin and leaden direction by Albert Pyun. Matt Salinger (son of J.D.!) stars, and gives it his all, but he’s not up to the heavy lifting required. How can I describe the 1994 Fantastic Four film? Let me state at the outset that I find it simply charming in a fan-film, “Let’s put on a show in the backyard” kind-of-way, and prefer it to the big-budget Fox “epics”. The short version of the film’s convoluted history: producer Bernd Eichinger optioned the FF, but nearing the end of a “make it or lose your option” (and money!) deadline, and with nothing on film, he turned to “King of the B’s” Roger Corman, who within months cobbled together a script, a cast, some very limited FX (but good “Thing” & “Doom” outfits), and got it on film–all for under a million dollars! To retain future financial considerations (re-makes, re-boots, etc.) the film would have to be exhibited theatrically, which it was –once, at the Mall of America in Minnesota, before going into the can forever. The game cast, who had little inkling that they were making a film that virtually no one would see, are mostly effective at inhabiting a set of characters that are the FF of Stan Lee & Jack Kirby, and much closer in origins and relationships than they had any right to be, all things considered. That said, nothing can quite overcome the shock of seeing a plywood “Reed Richards” arm waving from out of a car’s moon-roof during the wedding scene that concludes the film—amazing! If I seem harsh–I kid because I care! Despite my carping about their short-comings, all of these films are worth seeing, if only in comparison to what we’re privileged to watch today; and if you’re able to set your mind into “way-back” mode, it’s fun to revisit the early appearances on film of these great characters. It’s hard to believe now, after the run of high-quality Marvel adaptations, but it wasn’t so long ago that a film such as The Avengers was the “Impossible Dream”, only to be seen in the Theater of the Imagination. #1) He’s “David” Bruce Banner, because a producer told Stan Lee that “Bruce, as a name, seems too gay”. #2) The Punisher doesn’t wear his costume, as “It looks too much like a comic book”. John Vernon, a.k.a. “Dean Wormer” of “Animal House”, would provide the voice for Iron Man & Tony Stark on the 1960’s cartoon. There was a radio version of the Fantastic Four in the mid-70’s, and the voice of the Human Torch—Bill “Effin’” Murray! !